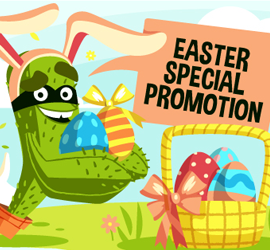 Save Money With Our Easter Promotion! Looking for the perfect way to surprise your loved ones during the Easter holidays? How about a straightforward way to bypass any geo-blocks that keep them away from their favorite shows and movies? If you like the sound of that, you’ll be happy to know we’re currently running a major promotion for our VPN and Smart DNS services within the following days – the perfect opportunity to get those close to you and yourself the present of unrestricted web access. No more “Sorry, this page isn’t available in your area” messages and annoying redirects – that’s the kind of Internet experience you’ll get to enjoy once you take advantage of our Easter promotion. And please go ahead and share the news with your friends and family too – or anyone else you think would really love a quick and easy way to unblock geo-restricted websites.